A St. John's-area father has built a whopper of an outdoor hockey rink to help raise money for charities that have been helping his disabled preschool son. 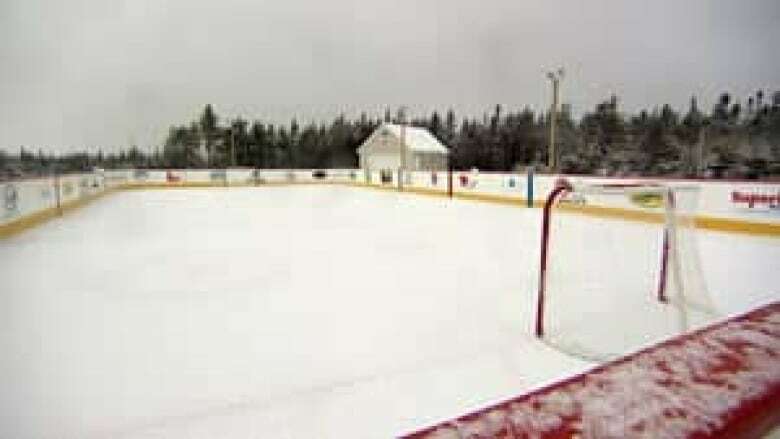 Todd Churchill started work in June on a rink that is backyard in name only. It not only has boards surrounding the ice, but has lights to allow play at night. "A lot of people at work, they have rinks that are 20x40, and again the Tim Taylor in me just would not allow me to do a rink that size, so I went 95x46 — as you would," Churchill said with a chuckle as he referenced Tim Allen's character on the 1990s sitcom Home Improvement. Churchill built the rink at his home in Portugal Cove-St. Philip's to raise awareness for three charities that have been helping his two-year-old son Carter, who is deaf and recently diagnosed with cerebral palsy. "It's great knowing that I am helping the charities that are helping him," he said. "It's a great mental break, too, because sometimes when you have stress in your life you need a distraction and that's what this has been for me." Companies who have made donations have ads posted on the boards of the rink, which has also been equipped with brand-new nets. Churchill said the response to the rink has been overwhelming, and he will build it again next year. "As any parent will tell you who has children with special needs, it's a very helpless feeling," he said. "You want to do something and this is what my wife and I have decided we are going to do. We've really thrown ourselves into the charities associated with his condition." Churchill said he has already raised more than $16,000.